Boil Test Brake Fluid Analyzer is s a liquid medium for transferring braking pressure in automobile braking system, and an integral part of braking system. Brake fluid is for braking the vehicle. Brake fluid is for braking the vehicle. It’s a liquid medium for transferring braking pressure in automobile braking system, and an integral part of braking system. As brake fluid has very well hydroscopicity, if the brake fluid is mixed with damp or water, vapor will be generated during the braking process. As vapor is compressible, it will be compressed in brake fluid, which will cause failure of braking. 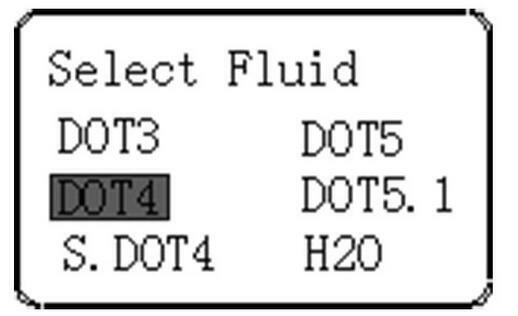 In the boiling point test for brake fluid, the brake fluid with lower water content has higher boiling point; while the brake fluid with higher water content has lower boiling point. From the boiling point, we can judge whether the brake fluid is in normal condition. 1.Please read this user manual carefully and use the boiling point tester. 2.This device must be used by professionals, or maintenance staffs who have been trained. Keep the device away from being played by children or persons other than maintenance staffs for automobile. 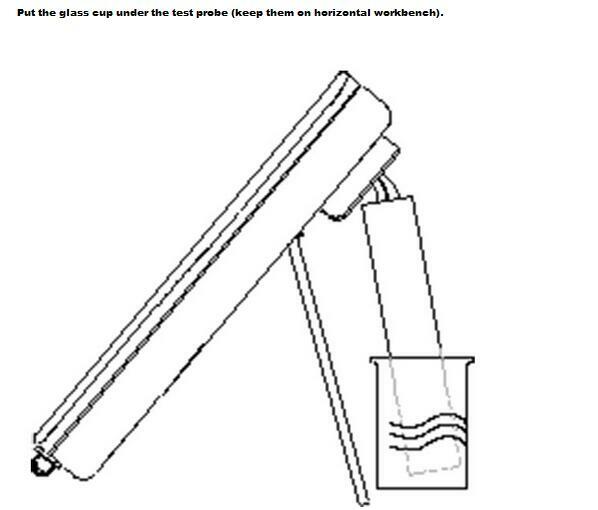 3.This device is specially designed for testing the boiling point of brake fluid. Please do not use for other purpose. We are not liable for any damage or loss of the device or other equipment and property caused by using the device for purpose other than testing the boiling point of break fluid. 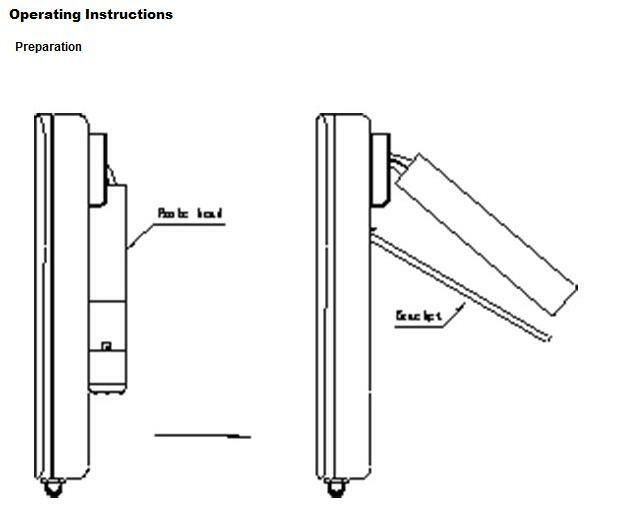 4.Please properly keep this user manual for reference in case. 1. Please read carefully this user manual before using the device. 2. Please do not start test if the fluid inside the glass is less than 20ml. Burning of test probe without fluid may damage the device. 3. After test, the test probe and the tested fluid are both hot, please do not touch. 4. After test, please dump the brake fluid when it’s cooled down naturally. After that, use clean water of 25ML to carry out the test procedure for boiling point again, in order to remove the residue brake fluid inside the test probe. 5. The tested brake fluid is damaged in structure, please do not put them back in the vehicle. Otherwise, there will be risk for driving. 6. The test data for same batch of brake fluid may be different as the structure of test samples is damaged after boiling. That’s a normal phenomenon. Put the main body on horizontal plane, and stretch out the test probe and support. Note: the volume of extracted brake fluid should be no less than 20ml, while no more than 25ml. Keep the glass cup dry, clean, no foreign matter and stains. Connect with 12V/DC power supply, then press power key to turn on the device. The LCD screen will display following image. 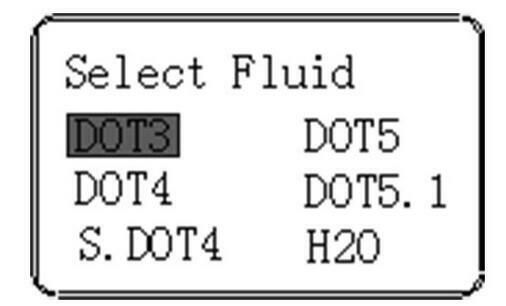 Select the type of brake fluid to be tested with function key. For example, DOT4. Press “Start” key, then following image will be displayed. Check the test result (according to the boiling point of sample brake fluid, the LCD screen will display one of three images as follows). A: “Good”. That means no need to replace brake fluid. B: “Replace now”. That means the brake fluid should be replaced immediately. 1. This device is only designed for testing the wet boiling point of brake fluid. It doesn’t support test for dry boiling point. The data of dry boiling point here is just for reference. 2. As brake fluid has very well hydroscopicity, if the brake fluid is mixed with water, vapor will be generated during the braking process. As vapor is compressible, it will be compressed in brake fluid, which will cause failure of braking. Therefore, when replacing brake fluid, the new brake fluid should contact with the air as short as possible. test mode to clear corrosive brake fluid and relieve corrosion to the test probe. 4. Please do not put this device in place where there is direct sunlight, or high temperature or humidity. Otherwise, the device may be deformed or damaged. How to judge whether the device is in good condition during using process? 1. Enter H2O (clean water) test mode, and check whether the boiling point is 100℃ which is the standard boiling point of clean water in standard atmospheric pressure. 2. 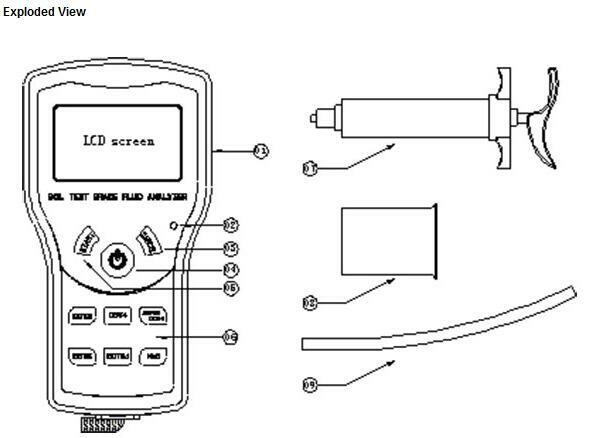 If more accurate calibration is needed, it’s a must to send the device back to the manufacturer. This device is covered by one-year warranty, except damage caused in following conditions. 1. Use of this device without following the user manual. 2. Refit of this device. 3. No regular maintenance and cleaning for the device. 4. Improper storage conditions (for example, falling down, immersion in water, oxidation of print circuit board, etc). 5. Force majeure (for example, fire, flood and power failure).